If you're tired of the same ol' average Thanksgiving dinner, that's nothing that $35,000 can't solve. - Squab stuffed with rich foie gras soaked in $5,000-per-bottle Courvoisier L'Esprit Cognac. - Roasted, farm-raised, organic turkey stuffed with 7lbs of ground Japanese Wagyu filet mignon. - Turkey gravy made from renderings infused with $1,750-per-bottle Chateau Mouton Rothschild. - Cranberry-orange relish with Gran Marnier. - Butternut squash infused with winter black truffles. -Creamy mashed potatoes with Swedish moose cheese. 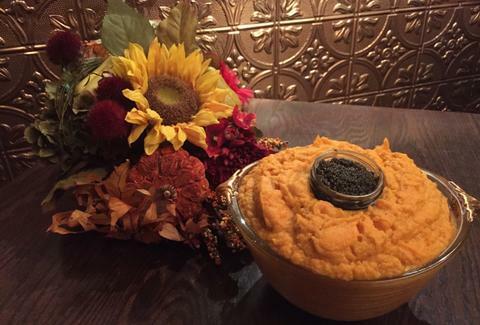 -Whipped sweet potatoes topped with Royal Osetra 000 caviar. -Poached & bourbon-soaked pears with pumpkin paste dusted with 24-carat gold flakes. And it doesn't end there -- in addition to the overindulgent banquet, attendees will also be treated to grandstand seating at the Macy's Thanksgiving Day Parade, a $6,000 gift card to Bloomingdales with limo service, and dancing lessons at the Fred Astaire Dance Studio. "We know it’s over-the-top, but Thanksgiving comes once a year," co-owner Marc Sherry said in a press release. "If you can splurge for this, you have a lot to be thankful for." And if you're one of those weirdos who'd rather not drop all your savings on Thanksgiving dinner, Old Homestead also offers a traditional meal for an easier $65. Pete Dombrosky is an Editorial Assistant at Thrillist and he'd still take his Mom's pumpkin pie over poached & bourbon-soaked pears with pumpkin paste dusted with 24-carat gold flakes. See why on Twitter.